Nothing beats the outdoors, except outdoor photography. If there is one common theme you’ll see in my blog posts it’s that I love outdoor photography. It energizes me . . . Like.The.Battery.Bunny! Pure, crackling energy. I simply love it! However, sometimes photographs are not what they seem to be. I am an attorney by profession. This means I am on the road from time to time traveling to hearings or depositions or meetings with clients. When this happens I always take a camera with me so I can constantly feed my addiction of uploading photos to the micro-stock sites I contribute to. On one particular trip, in February of 2007, I decided that I wanted to travel light. So rather than taking a camera bag of equipment I took a single point and shoot camera. It was the (then) powerful Nikon Coolpix 5400. Not exactly a traffic stopper by today’s standards but at the time it was a cutting edge marvel with an articulating 1.8 inch digital screen and 5.1 megapixels. Anyway, after traveling for some time I stopped for a much needed break. There was a small amount of fresh snow on the ground. I walked around looking for something photo-worthy along the road. When I walked back to the car I saw one of my footprints in the snow. I literally snapped a couple of shots and then drove away. Shot with the venerable Nikon Coolpix 5400. 1/80 at f7.9; zoomed to about 58mm; ISO 50. Several days later I downloaded the images and decided to work up and submit a shot of my footprint. Done and forgotten. 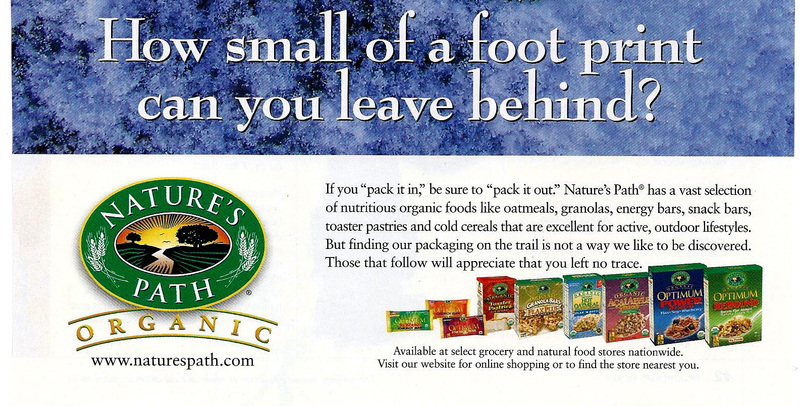 The actual advertisement that appeared in the Backpacking Magazine in 2007. I liked the ad and the photo but it bothered me because the photo looked vaguely familiar. Then it hit me. I took the ad to my computer, found my photo in the depths of the hard drive, compared them side by side, and discovered that the photo in the ad was mine! It blew my mind that a photo that I had spent about 2 minutes on total, taking it; processing it; and submitting it, could be used as an ad in a national magazine and actually look pretty good. I’m still shaking my head over the whole thing. I’ve come to realize that inspiration, or serendipity, or just blind amazing luck, can strike at any time! Another testimony as to why we should always carry a camera with us even if it is an out of date point and shoot. That’s how I got the shot! I’d love to hear any comments or questions you have. Please leave comments below.